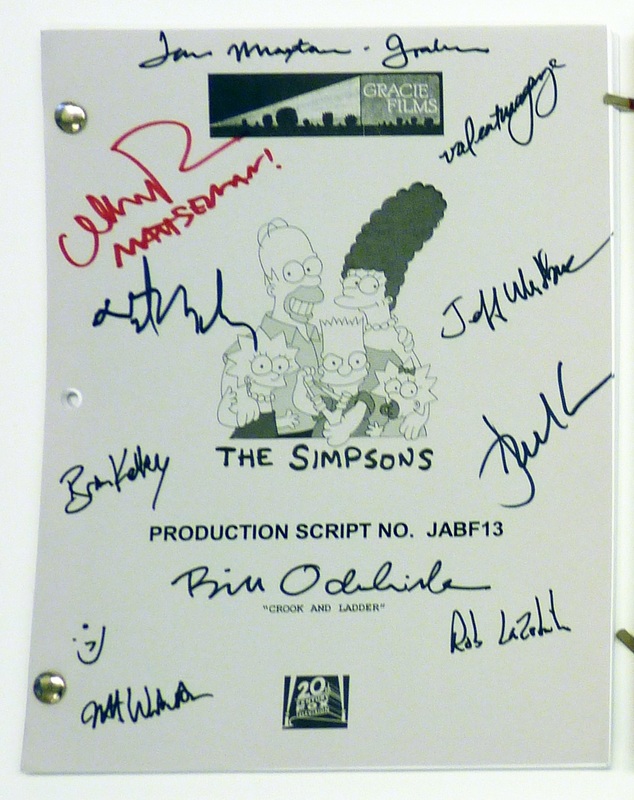 ← 396 "The Boys of Bummer"
The TV moves aside as the Simpsons are put through a car wash, where they get sprayed with water, blasted with hot wax, and scrubbed with prickly brushes. In the end, Marge’s hair is puffy, the family looks miserable, and Maggie’s pacifier is gone. Three men come in, wipe the family down with rags, and give Maggie a new pacifier. "I will not look up what teacher makes"
"Crook and Ladder" is the nineteenth episode of The Simpsons' eighteenth season. "After Homer takes pills to help him sleep and crashes into the Springfield Fire Department. There he, Apu, Principal Skinner and Moe Szyslak become voluntary firemen and begin to steal property from the homes of fire victims." Marge, following the advice of a parenting magazine, takes away Maggie's pacifier, leading her to destroy the inside of the Simpson home. Marge decides to get Maggie a new pacifier, but can not find the right brand. Luckily, Santa's Little Helper gives Maggie his squeaky toy that not only calms her down, but also leads to Homer being unable to sleep. He then takes sleeping pills (Nappien) and becomes a "fat, suggestible zombie dad". One night, Bart and Milhouse take advantage of him by having him take them places. Homer then wakes up while driving, causing him to crash into the Fire Department, injuring all the firemen and landing them in the hospital. 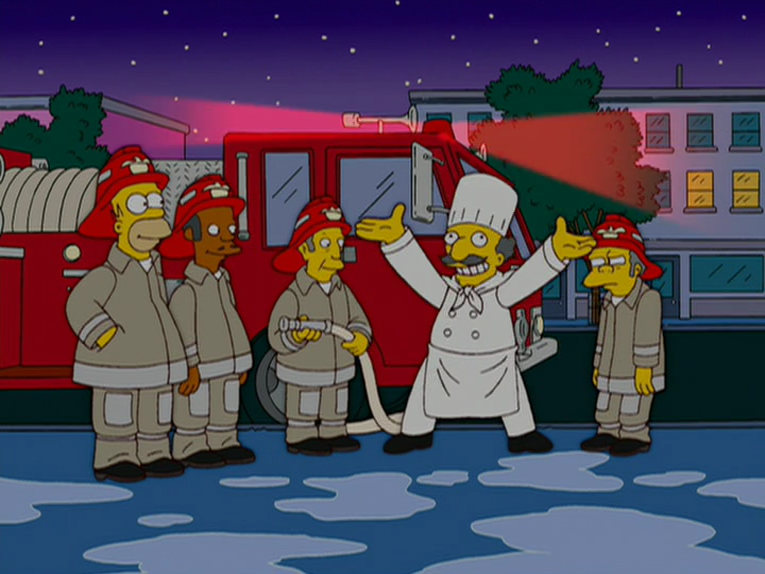 While they recover, Homer, Apu, Moe, and Principal Skinner become volunteer firemen. After the first few fires, they are rewarded for saving the buildings. They then save Mr. Burns' house, but he gives them no reward. Feeling cheated, they decide to steal some of his treasures, covering their tracks by claiming they were destroyed by the fire. From then on, they start taking items from the places they save for their payment. After Marge and the kids see Homer stealing, she gets them to make a very sad face. Everywhere he goes, the kids come out of nowhere to show him how sad they are. After the sad faces begin to get annoying, he decides to stop, and convinces the others to stop stealing, after saving Moe's and Apu's life. They then give all of their loot to the homeless. The episode was watched by 7.72 million viewers on its original airing. Modified on July 1, 2018, at 15:15.